Your "Old Kentucky Home" is one of your greatest investments. Join the more than 325,000 Kentuckians who protect their home with an insurance company based right here in the Bluegrass State. Our agents are hometown people delivering honest answers, good advice, and quality customer service from within your community. We have adjusters throughout Kentucky. When you file a claim, you can expect it to be handled quickly and efficiently by a local claims office. No two homes are exactly alike, so no two policies should be either. Your local Kentucky Farm Bureau Insurance agent will help you select the protection that meets your needs. You can even tailor your policy to provide additional coverage for those extra special valuables, like jewelry, musical equipment, or computers. Your landlord's policy does not protect your personal property (like electronics, furniture, and clothing). If you live in an apartment or rental home, a renter's insurance policy protects your personal property. If you own your condominium, your policy offers personal property coverage, as well as coverage for your condo unit. If you have a covered loss, we also provide coverage for certain increased living expenses. Check out a brief description of some of our discounts below. If you're interested in learning more, chat with your local agent for specific rules and eligibilities. 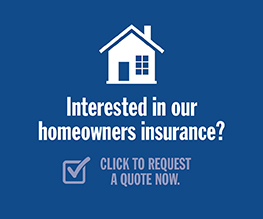 For answers to frequently asked questions regarding homeowners claims, click here.